Recchia, AnnaMaria, age 90, February 15, 2018. 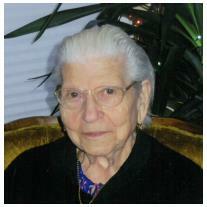 Beloved wife of the late Luigi for 58 years. Dear mother of Carlo (the late) and Angelo. Proud grandmother of Carlo and Rocco. Loving sister of Carmen Colella, Mario Colella and Anthony Colella. Instate Monday, February 19th at 9:30am until time of Mass 10am at St. Joan of Arc Catholic Church, 21620 Great Mack Avenue, St. Clair Shores.